The DC Design House is set to open its doors and there's design inspiration for everyone - from the traditionalist to those with a contemporary bent. There's also 29 spaces this year and since there's so much to show you I'll be spreading it out over a few posts. 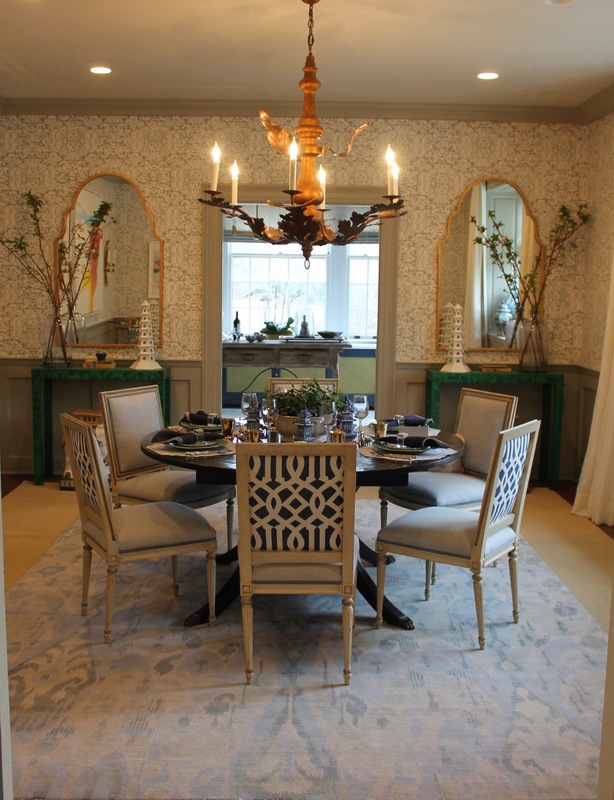 First up is the beautiful, family-friendly dining room designed by Marika Meyers. While pretty and inspiring, it's also durable and fun. Notice the chinoiserie table with gold-sprayed plastic animal figurines. Fun for kids and adults alike. Dining room chairs were covered in a Perennials outdoor fabric that feels like a high-end indoor fabric. Wearstler Trellis provides contrast on the back. Love the blue ribbon detailing. The walls are wrapped in China Sea's San Marco paper with a custom gray paint to match. 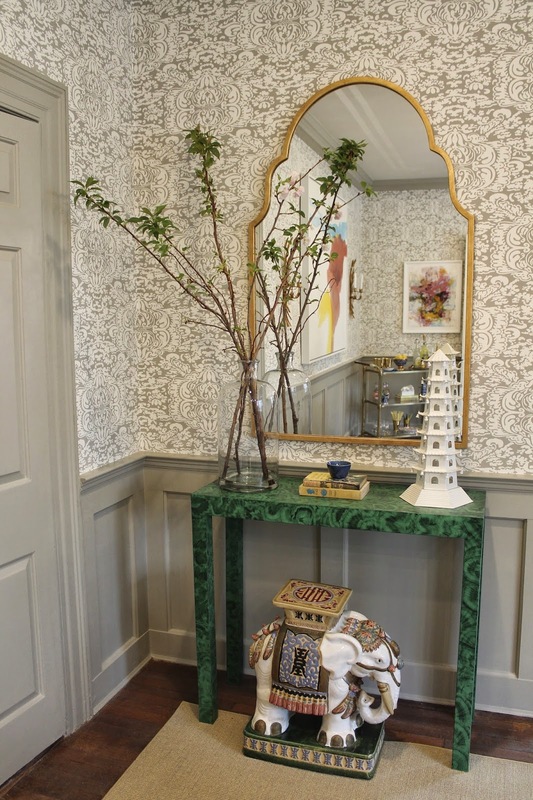 Custom-built parson tables received a gorgeous malachite finish by decorative painting studio Billet Collins. 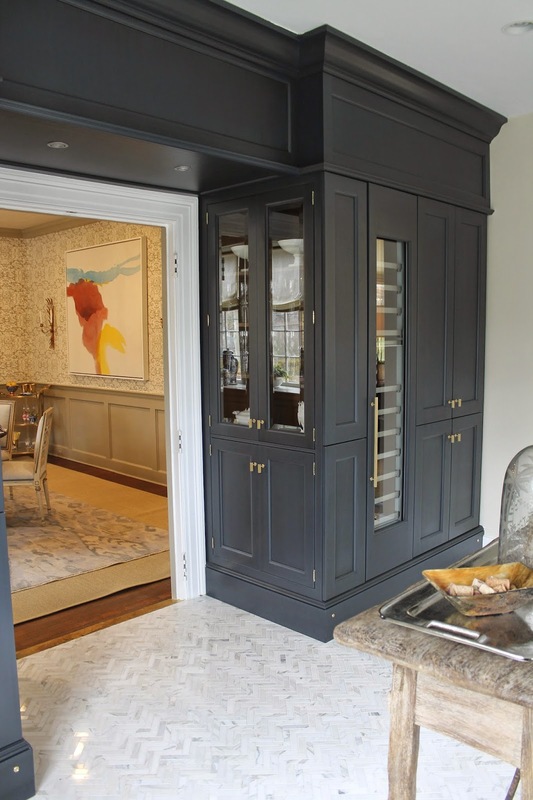 Next to the dining room is the Butler's Pantry/Wine Room by Nadia Subaran of Aidan Design, who also did the kitchen. 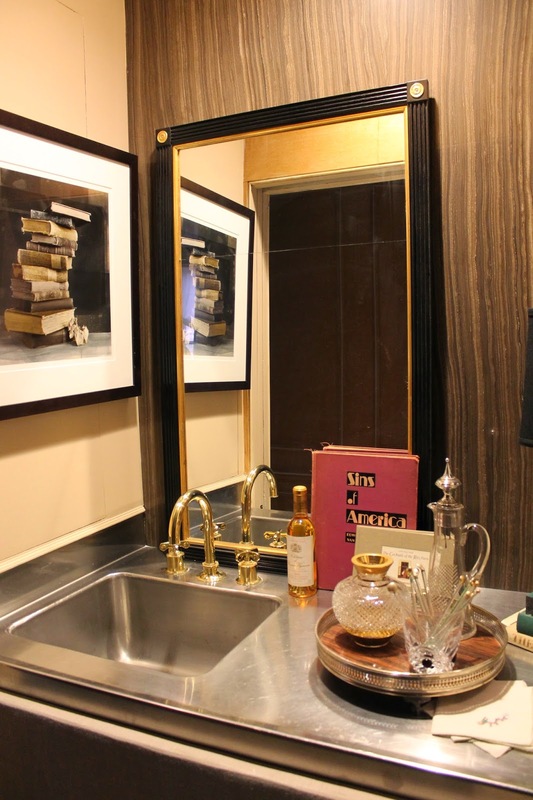 The room is wrapped in Wood Mode's Vintage Navy cabinetry with touches of brushed brass throughout. 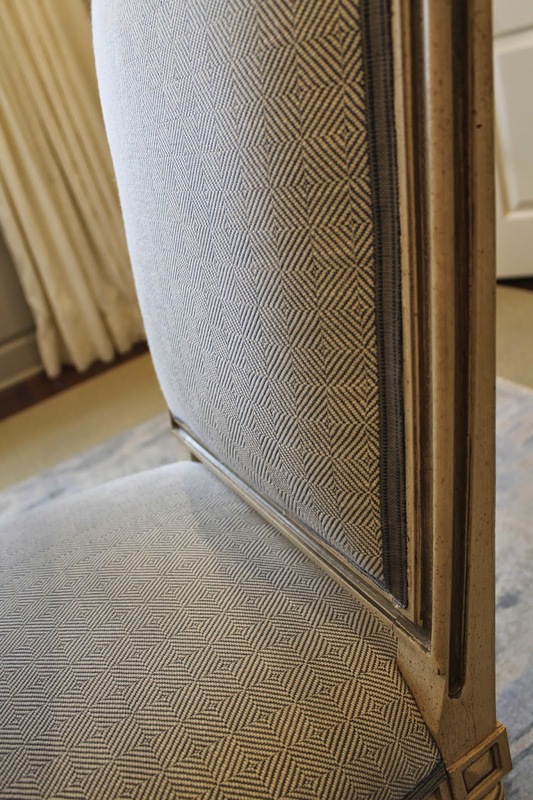 The herringbone calcutta floor is a stunner and the vibe is decidedly elegant. Victoria Sanchez, designer and owner of the fab Old Town Alexandria store Victoria at Home created a relaxed, cozy family breakfast room. The room was framed with a deep shelf hugging the L-shaped window and sectional and there is a great mix of casual fabrics throughout. The ceilings are covered in the same print as the shades. I always love Victoria's styling! Ok, that's just 3 rooms. Here's 3 more on the main level - and that's not even all there is. 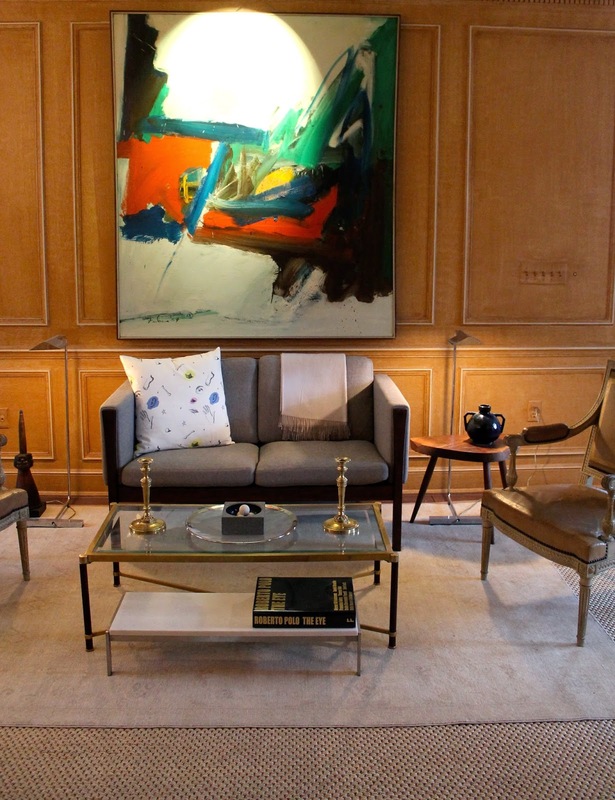 Kelley Proxmire's living room is one of my favorite rooms that she has done recently. Walls were lacquered in a high gloss gray and a mix of sophisticated furnishings and art create a space that is as equally comfortable as it is elegant. 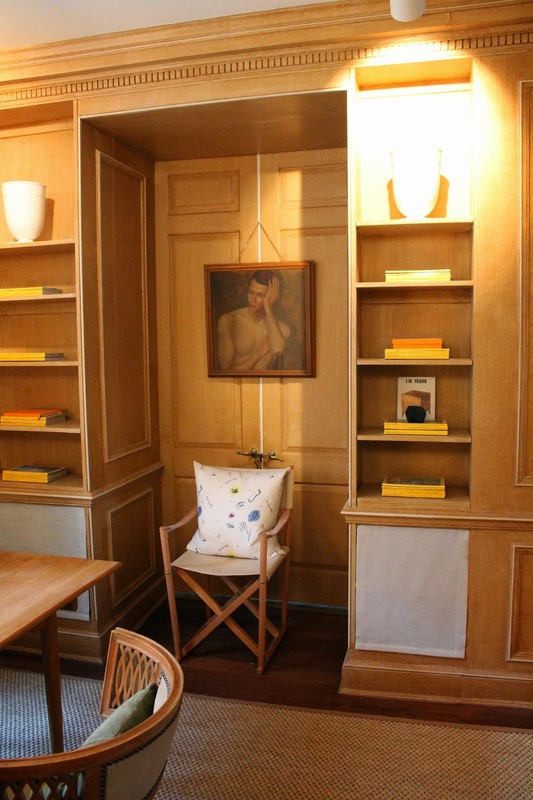 Nestor Santa-Cruz, my perennial favorite, has transformed the faux bois paneled library with his hallmark European sensibility and eye for the perfect furnishings and accent pieces. Notice the original 70's track lighting - he somehow makes it look current. Muslin panels cover the lower shelves quiet the feel as well. 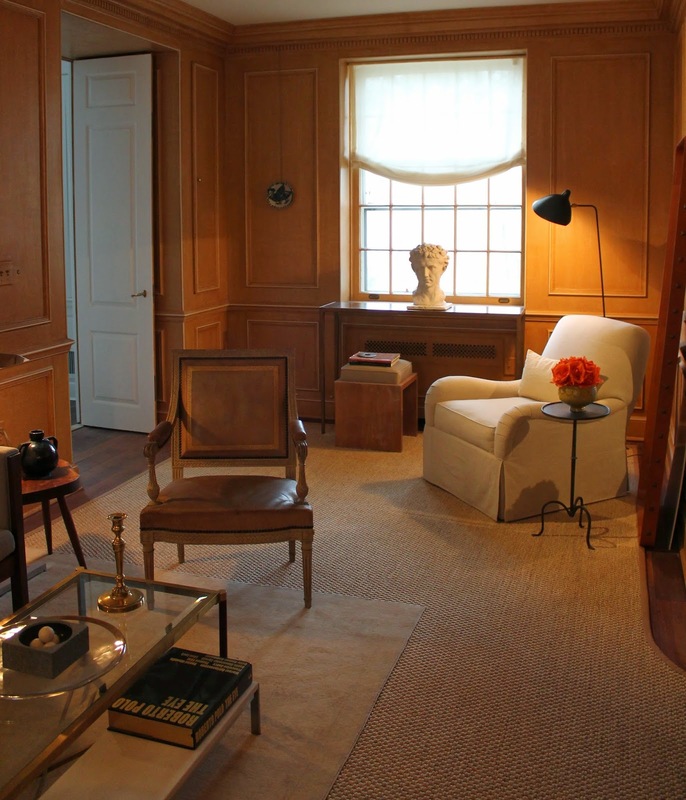 I love this view of the room - past the leather chair with its lovely patina onto the club chair, bust and sculptural light. So soft and inviting. 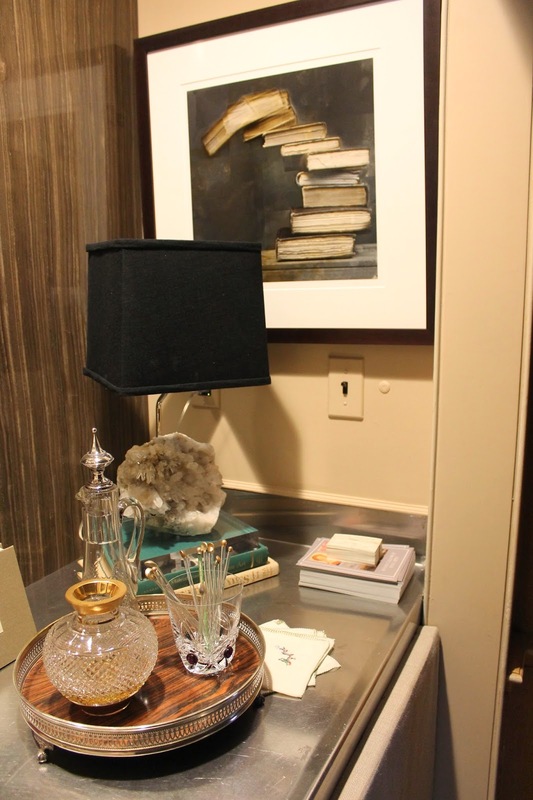 Now for the swankiest, smallest space in the house - Tracy Morris' library bar. Stainless steel, unlacquered brass and a wood grain limestone make for a fashionably hip mix. Love the rope chair Tracy placed here. Ok, there is SO much more to see. More posts to follow in the next two weeks. Head here for your tickets - you won't want to miss it. what a fun tour. that kitchen is amazing. I am in love with that wine/butlers pantry!!! Thanks, Michelle! Love that kitchen and entry wallpaper and console!! Thanks so much or sharing this. What a beautiful showplace of great talent! Fabulous preview! I am a huge fan of Mia, Kelley and Nestor!! I'm taking my mom to tour this show house this year. Ooops Mia is Marika - I should explain. Apologies! Loving this preview! The butler's pantry looks fab! Too bad I'm a bit out of the way otherwise I would be sure to swing by. Very lovely and well thought out cohesive flowing rooms and colors. All the rooms are approachable and not overly show house decorated. Nice descriptions and photos, looking forward to more show house posts. Thanks Michelle....I love how classic and sophisticated it is....sometimes in Atlanta they lose their focus to be a little too daring. Adored Victoria's space....she is so sweet! Beautiful tour so far. I would die for those navy cabinets. And the gorgeous gray high gloss walls. Impeccable styling in that room. I can't wait to see the butlers pantry/ kitchen in person!